>There comes a point, when all the miles and hotel points have to mean something… and that something is to be as far removed from home life as possible… just for a little while. 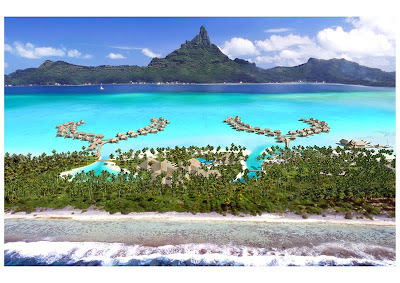 So realising that I could throw a load of my Priority Club points towards an Overwater Bungalow at InterContinental’s Bora Bora Spa… it’s now time to work out how Mrs Schofs and I are going to get there. OK, So I’ve got loads of BA miles (for OneWorld redemptions), BA OnBusiness points (for BA redemptions), plenty of BMI miles (for Star Alliance redemptions), and a handful (130,000) of AA miles (for OneWorld and other AA partner redemptions). Surely with this load in my pocket… it must be EASY to get 2 people to anywhere!! Tahiti is the main airport near to Bora Bora, which is served by Air Tahiti Nui, Air New Zealand, Air France, and Hawiian Air. My only requirements… getting there in Business Class or higher, with as little cash outlay as possible, and sometime around September (although I can be flexible on the dates). Oh, and if I have to cancel, I don’t want to lose all my miles! My first plan was to fly to LA on BA in FIRST, using 150,000 BA miles and an Amex 241 voucher. A quick look at miles redemption availability shows that I can easily get the flights I want, and have my pick of the days. Result. I’m half way there. Now just the flights from LA to Tahiti. First stop – searching on Expedia. This showed up flights by both Qantas and Air Tahiti Nui on the LAX-PPT route. Well, almost. Actually it’s only Air Tahiti Nui on this route, as Qantas code share. This was also a little odd as many sites on the net say you can get there on Air New Zealand (a Star Alliance partner)… and you can… until 2nd April 2007, when they pull out. This is a real shame, as I’d quite like to try their new Business Premier product, which uses the beds that Virgin Atlantic Upper Class have. Also, since Qantas only code share on this route (they don’t actually fly their planes on it – they just sell it and let Air Tahiti Nui do the flying), I can’t use my BA miles to fly it. AA are partners with Air Tahiti Nui, but a return flight for 2 in Business Class would be 250,000 AA miles… significantly more than I have. My only option is to pay for economy tickets (about ¬£1000 for 2 people) and PRAY they’ll let me upgrade at the airport for not too much. If it was a 3 hour hop, I could handle economy. 7 hours is a bit much for a man with long legs! OK, this is getting more interesting. Air New Zealand fly Sydney-Auckland-Tahiti in business for very few BMI miles (as it’s all in the same “zone” – South Pacific). Result. I currently have enough OnBusiness points for 1 person to fly London-Sydney, but not 2. If I work hard, I *might* be able to get enough, but it’ll be a bit of a struggle. The fatal blow to this plan came when checking the flight availability with Air New Zealand on the Auckland-Tahiti route – with only one flight each way a week… this means very few award seats up for grabs. I’d have to fly one way in Economy… not ideal for 7 hours. Plan 3 – Round the World! This way is much more exciting! One way London to LA on BA with BA miles. One way LA to Tahiti on Air Tahiti Nui with AA miles. One way Tahiti-Auckland-Sydney on Air NZ with BMI miles. One way Sydney-London on BA with BA OnBusiness points. The BA availability is there to LA. I have enough BA OnBusiness points to for 2 to fly in Business from Sydney-London. And using AA miles on Air Tahiti Nui…. no. AA “don’t do” one-way. They only allow return trip miles redemptions. Arrrrrrrrrrrrrrrrrgh! So it’s back to the “Pay and Pray” technique for LA-Tahiti on Air Tahiti Nui. This is pretty much my last option… if this doesn’t work… I’m going to have to try and compromise some of my requirements… or just take the easy route and go on holiday somewhere sensible!! It turns out that Air Tahiti fly from Japan to Tahiti, and Asia-South Pacific miles redemptions are much cheaper than US-South Pacific. In fact, the cheapest of all is from Hong Kong to Tahiti at 140,000 AA miles for 2 Adults in Business Class. Japan to Tahiti would be 160,000 AA miles. Ironically, the only easy way from Hong Kong to Tahiti is via Japan! Fortunately AA redemptions only really take into account where you start and where you finish, assuming you go a logically direct way… So I can fly on Cathay Pacific to either Osaka or Tokyo, and then on to Tahiti on Air Tahiti Nui, all in Business for 140,000 AA miles! Unfortunately AA don’t allow stopovers outside of the US, so I wouldn’t be able to stay in Japan, which would be quite nice……… or can I??? Actually, by not flying the last leg of the return (Japan – Hong Kong), we could spend a couple of nights in Japan and then just jump on a BA plane straight back to London, still using the same BA miles that got me to Hong Kong (an Open Jaw ticket)!! Result! A quick call to AA has confirmed that there’s a fair bit of availability, and there are loads of BA flights that would suit! And to top it all off, if I cancel, I get all my miles back (for a small fee)… Perfect.